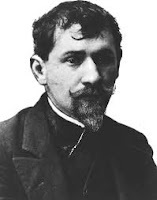 Published in the years 1895-96, Przybyszewski’s Homo Sapiens is a trilogy of novellas comprised of Overboard, Under Way, and In the Maelstrom, detailing the rise and moral unraveling of a young Polish author in 1890’s Berlin and, according to George Schoolfield in his A Baedeker of Decadence, contains more than a modicum of autobiographical reference. Erik Falk is an aspiring superman and nascent anarchist who, in these episodes, leaves a trail of suicide and broken spirits in his wake. The first novella describes his seduction of Isa, the girlfriend of an original and promising artist (modeled after Edvard Munch). Self-satisfied, he escapes with his prize even as the artist kills himself in despair. In the second installment, Falk, now with a wife and child at home, goes on an extended trip to his home town, and there becomes obsessed with the seduction in mind and body of a pious young girl. With his mission accomplished, he again takes his leave. Abandoned, and learning that Falk has a wife and son back in Berlin, the girl drowns herself in the river. In the Maelstrom continues Falk’s downward spiral. Already an alcoholic, and with yet another mistress and child hidden discreetly away, he becomes obsessed with threats by an acquaintance, a former political ally with whom he has fallen out, to reveal his secret life to Isa. Falk brings others into a web of deception, and, when deepening despair brings him to thoughts of suicide, he finds himself lacking the courage, and so goads another anarchic socialist acquaintance, who maintains some curiously bourgeois sensibilities, into challenging him to a duel of honor in the hope that the man will kill him. But fate has other plans, and, now abandoned by his wife, Falk gets out with nary a scratch. Buoyed by a sense of egotistical invincibility and cleansed, through monomania and psychic degradation, of all the binds of family and social obligation, he coolly picks himself up, finds another woman, and strides off to begin again. 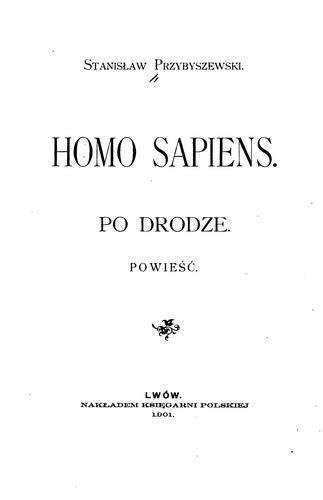 Homo Sapiens was published in English translation by Knopf in 1915, with a laudatory introduction praising Przybyszewski as Poland’s greatest living author. However, as Schoolfield notes, the “obscenity” of the subject matter, combined with the author’s pro-German sympathies during the First World War effectively marginalized him from the English-speaking world. Some of his works, including the 1915 edition of Homo Sapiens, can be found on Internet Archive, albeit in a somewhat overwrought translations which would likely benefit by some updating. The political concerns of the time, which result in a couple of long digressions in the book, hold no special interest for most readers anymore, but Schoolfield’s essay gives a good overview of the presence of the anarchic terrorist in a surprisingly wide range of works of the time from Conrad to Bely, and from Conan Doyle to Chesterton. 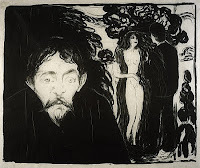 The theme of the Nietzschean anti-hero who abandons the strictures of conventional morality was becoming a convention of philosophical literature at the time this trilogy was written, and would continue through to Brecht’s Baal and beyond. If you can deal with the issues inherent in a translation almost a century old, I’d recommend fellow devotees of decadent literature to seek this one out.